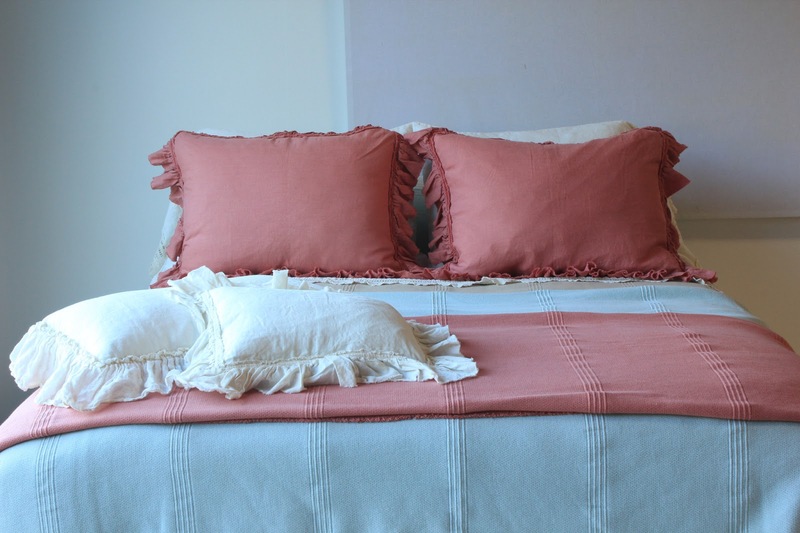 Bella Notte Linens has introduced two exciting new colors and two new bedding patterns for Spring 2013. See the world through rose-colored glasses with the newest color ... Coral! 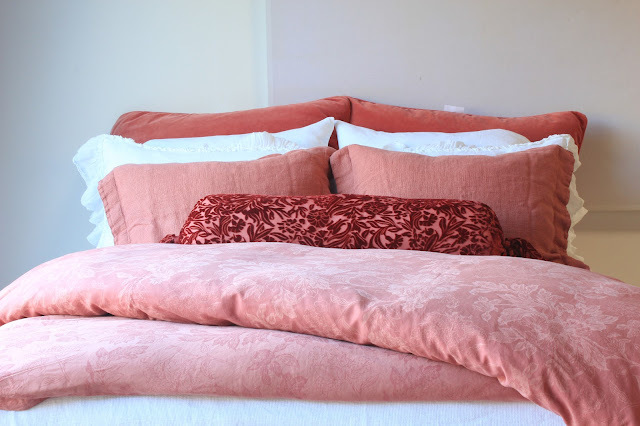 A sunny combination of red, pink and orange, this color will make any bed blush a summery glow. Add a pop of warm Coral atop a crisp White ensemble, or create a beach-side vibe by layering light, billowy textures in Coral, Seaglass, and Sand. Show above: Velvet with Satin Shams in Coral, Whisper Linen Pillow Shams in White, Homespun Shams in Coral, New Primrose Bolster in Coral, and Vivianne Duvet Cover in Coral. The perfect blue ... Wedgewood is a gorgeous, soothing blue that harmonizes perfectly with Bella Notte's spectrum of tones. 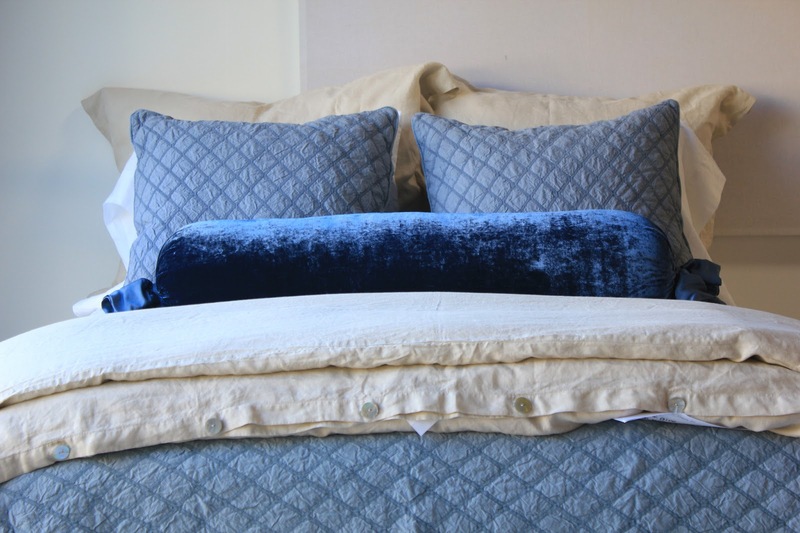 Show above: Chesapeake Coverlet and Standard Shams in Wedgewood, Silk Velvet Bolster all in Wedgwood, Linen Duvet Cover in Sand, Linen Pillow Shams in Sand. Looking for texture, find it with Bella Notte's newest pattern ... Hayden. A linen cotton blend, Hayden is a handsome stripe with clean lines and understated elegance. 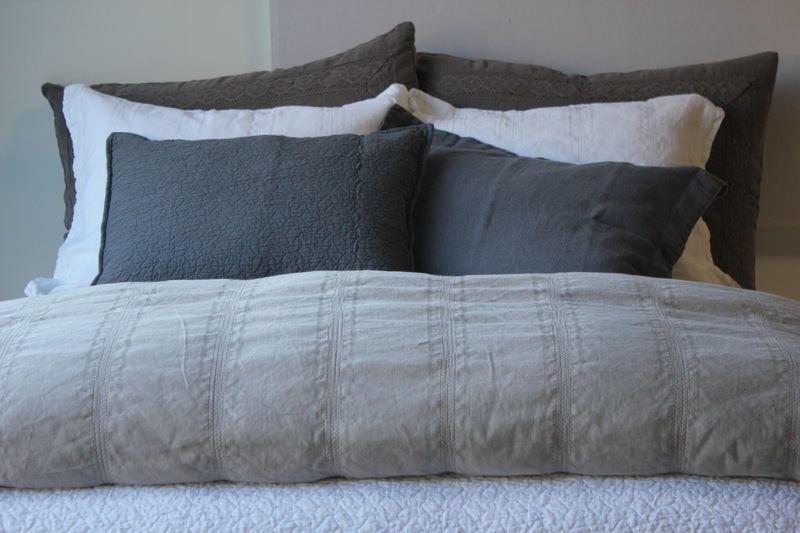 Show above: Hayden Duvet Cover in Flax, Hayden Shams in White, Davenport coverlet in White, Homespun Linen Shams in Graphite, and Davenport Sham in Graphite. Adding texture with warmth, Quinn is a heirloom blanket in 100% soft, cotton. Shown above: Quinn Blanket in White, Whisper Linen Shams in Coral, Whisper Linen Throw Pillow in White, and Quinn Blanket in Coral.